From New York Times bestselling author and host of Food Network’s Healthy Appetite, Ellie Krieger's revised and updated 12-week wellness plan, now with 25 new recipes for nutrition-packed meals and snacks, plus dozens of tips for apps and web sites to help you make the best choices for a healthy body. This is an easy-to-start, simple-to-maintain, scientifically sound, 12-week program of small steps—just three each week—such as starting a food journal, choosing healthy fats and proteins, and replacing refined grains with whole grains. Now with 65 recipes, this revised edition helps you free yourself of junk food cravings and replace additive-laden fake food with healthy, real food for better sleep, more stamina, and a slimmer waist—all while eating delicious food. And you won’t be forbidden to eat a single thing! Krieger also tells you what technology to use for tracking your fitness progress and finding others who share your interests. At the end of twelve weeks, you will be armed with easy recipes (she includes the nutritional breakdown for all of them)—such as Poached Salmon with Mustard-Dill Sauce, Whole-Grain Rotini with Tuscan Kale, Pita Pizzas, and numerous easy, satisfying meals, to get you off the diet rollercoaster and eating healthy, so staying fit will be second nature. 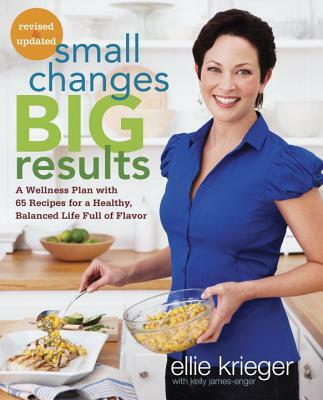 ELLIE KRIEGER is well known as the host of Healthy Appetite, the popular Food Network and Cooking Channel program. She is the author of the New York Times bestselling cookbooks The Food You Crave (recipient of James Beard and IACP awards) and So Easy, as well as Comfort Food Fix. She holds an MS in nutrition from Columbia and a BS from Cornell. Ellie lives in New York City.